The Ugborodo shoreline in the Delta State of Nigeria was affected by strong erosion and tidal flooding due to its low-lying topography. Repeated loss of farmland and dwellings forced the local Itsekiri community to move away from the area which had a negative effective on the neighbourhood and economy. Maccaferri designed and provided an effective coastal protection solution combining geotextile MacTubes and Reno Mattresses. The Niger Delta Development Commission (NDDC) was searching for a remedial action to redress the erosion of the Ugborodo shoreline, in Warri South West, Local Government Area of Delta State. Ugborodo is a riverine community situated between the Escravos River and the Atlantic Ocean. The population belongs to the Itsekiri ethnic group that presently number about 6,000 people, whose main occupation is fishing. Due to the low-lying topography, this area was subject to tidal flooding and severe drainage problems. When rivers and creeks flooded their banks, there was a huge loss of farmland and dwellings, creating significant social and economic damages. In some cases, a whole village was flooded. As the coastline retreated and the topography of the land was lowered under tidal erosion, inhabitants were forced to abandon their homes and move further away. 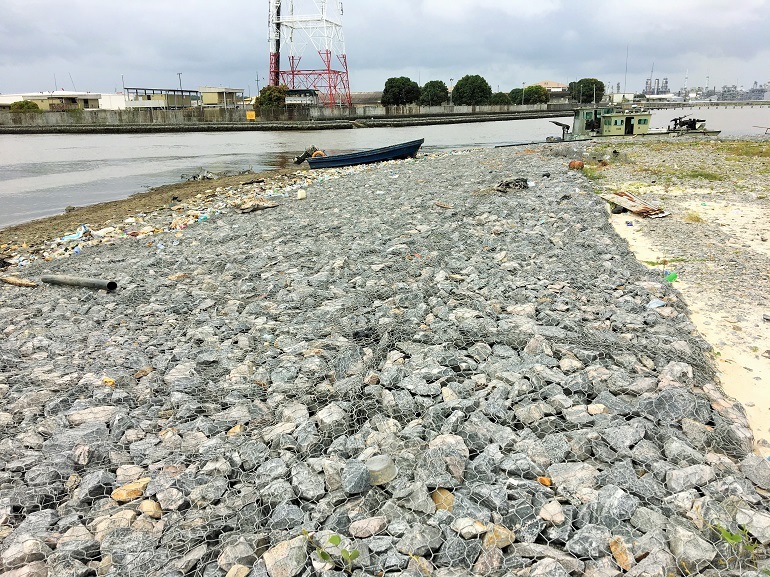 Maccaferri designed a revetment solution combining our traditional hydraulic works and erosion protection product Reno Mattress with our innovative geotextile tube MacTube to create detached breakwaters. This combination effectively protected the shoreline as MacTube breakwaters reduce the intensity of wave action in inshore waters, while Reno Mattresses provide protection from erosion. Not only is the community now restored and the longshore transport substantially reduced, but a beach was also created as a result of trapping sand in front of the revetment. This solution had the added benefit of being easy to install and employed local labour. For further information, please click on the case history to download and read more.